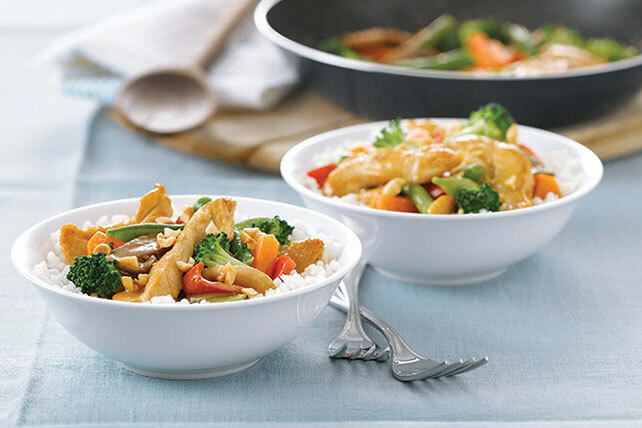 This chicken stir-fry skillet is quick and easy. Just cook chicken breast strips with a few pantry ingredients, and it's ready in 25 minutes. Heat 1 Tbsp. dressing in large skillet on medium-high heat. Add chicken; cook and stir 4 min. or until done. Add water, soy sauce, onion and stir-fry vegetables; stir. Bring to boil. Stir in rice and remaining dressing; cover. Remove from heat. Let stand 5 min. Fluff with fork. Top with nuts. Substitute boneless beef steak for the chicken.